Wolfe and Woodlawn had little in common except a rebellious spirit, bold and unstoppable, and a determination to wring every bit of life out of their time on this planet. 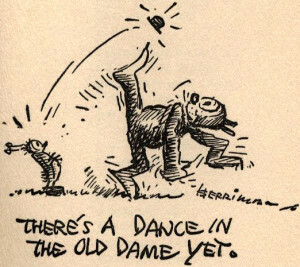 So it’s no surprise that The Times has compared both women to Mehitabel, the brassy, bawdy alley cat whose adventures were captured in Don Marquis’s classic 1927 collection of tall tales and light verse, “archy and mehitabel.” The comparisons span many decades but are nonetheless fresh. The Times’ Margalit Fox, in her obituary of Wolfe, wrote that to be in her presence “was to find oneself enveloped by an amiable hurricane, equal parts Holly Golightly, Auntie Mame and Mehitabel, the dowager cat at the center of ‘Archy and Mehitabel,’ Don Marquis’s celebrated World War I-era column in The Evening Sun. Don Marquis first wrote about Mehitabel in 1916. Nearly a century later, it’s remarkable to see that Mehitabel remains a touchstone for women such as Wolfe and Woodlawn — brave, unrelenting and thoroughly fascinating. The world needs more of them. This entry was posted in News and tagged archy, Don Marquis, Holly Woodlawn, Janet Wolfe, Margalit Fox, mehitabel, Shinbone Alley, The New York Times, Vincent Canby by John. Bookmark the permalink.